Pour les futurs amateurs de planches à roulettes! 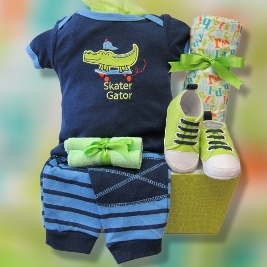 Notre ensemble-cadeau alligator amateur de planches à roulettes comprend une combinaison en coton, des pantalons et des chaussures assortis, une petite couverture douce et un ensemble de débarbouillettes. Newmarket, Niagara Falls, Ottawa, Oshawa, Ontario, North York, North Bay, Oakville, Orillia, Peterborough, Pickering, Port Perry, Richmond Hill, Sarnia, Sault Ste Marie, Scarborough, Cornwall, Burlington, Ste Catherines, Nepean, Actonvale, Ajax, Alexandria, Almonte, Ancaster, Lancaster, Ayers Cliff, Beamsville,Bolton, Borden, Brampton, Bowmanville, Brantford, Brock,Caledon, Caledonia, Cambridge, Casselman, Clarington, Collingwood, Don Mills, Downsview, Scarborough, Elgin, East York, Dundas, Dryden and Etobicoke.